God’s Trigger is by no means a hard sell. It’s Hotline Miami with two players. There’s no question that’s what it is, either. It’s a brutally violent top-down shooter with one-hit kills. It’s the kind of concept that fits on the back of a beer mat, and it’s all the better for keeping it simple. So you and a buddy shoot your way through biker bars, warehouses and towns picking up discarded weapons and putting enemies down with one shot on your quest to take out the four horsemen of the apocalypse. You’ll start approaching rooms with different tactics – as soon as the doors are open the action kicks off, and one-hit kills mean it’s a stop-start kill-or-die kind of game. It becomes crucial to time attacks to thin out the enemies as quickly as possible, and you’ll find yourself slogging away at levels and particular rooms multiple times before you finish it alive. Fortunately the checkpointing seems nice and generous to keep the teeth-grinding to a minimum. It’s a hard game but you will make progress. God’s Trigger also throws in end of level situations, if not bosses. My shoot out ended in a pool hall with a bunch of crazies rushing us, escalating in danger from swinging baseball bats to toting SMGs. My first attempt through the whole level had me dying 25 times or more. But once I had the patterns down and better tactics beyond kick in the door and wave the .44, I got my performance down to 8 deaths and D rating up from an F. I’d like to try it a third time too. There’s the ability to revive your partner in God’s Trigger but you have to be quick as you’re given only a few seconds to patch them up. Healing takes a couple of seconds so it’s a tense few moments that can feel like an age. If one of you dies the other also corks it, so you don’t really get a choice. With that in mind it’s important not to stray too far away from each other in the pursuit of better weapons, ammo and other pickups. Weapons are pumped and dumped quickly as you shoot a clip and scramble for the next magnum, shotgun or submachine gun hoping it’s got a few more than a handful of bullets left in it. You can also play the game single-player but without the revive mechanic. That seems like a fair trade as you no longer have to watch your partner’s back, but there’s an equal amount of enemies and from what I could tell they were armed just as lethally. It felt fine in single-player, but it’s a game built with couch or online co-op in mind from the start. 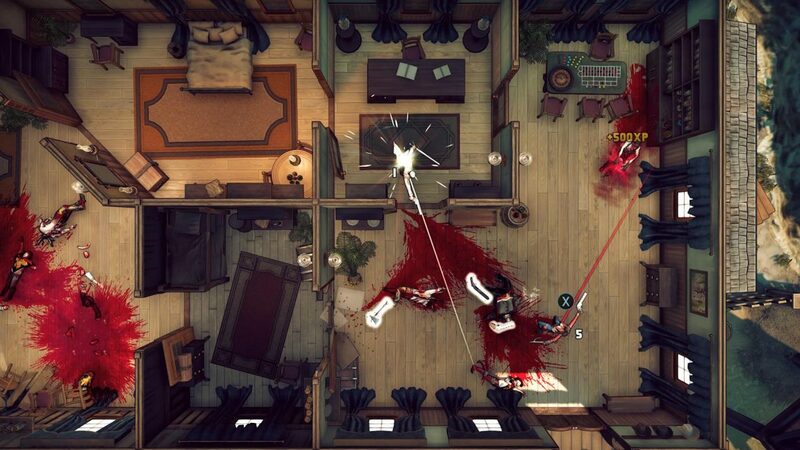 God’s Trigger might not have the retro style and seedy vibe of Hotline Miami but it does have its own comic book looks. It’s brutally violent too, which fits the lethal gameplay. You die and spread claret all over the floor and games are over in seconds before restarting to do it all again. There’s every reason to like God’s Trigger even though it will forever be in Hotline Miami’s shadow. You could call it a rip-off or say it’s inspired by it, but there’s no denying the fun in playing with a buddy in quick and tense shootouts. God’s Trigger is out for PS4, Xbox One and PC in Spring 2018.